Introducing the first of 12 blocks for the New! Afternoon Picnic—Summer Picnic, Nancy’s Spool. This block is originally featured in Nancy Zieman’s own book, No-Hassle Triangles Quilt Blocks along with Nancy Zieman’s No-Hassle Triangle Gauge by Clover. Team Nancy Zieman thinks this is a great start to the new year and new block of the month! Each month, we will feature one block design. The blocks are created using Nancy Zieman’s NEW! Afternoon Picnic Fat Quarter Pack from Riley Blake Designs (*18″ x 22″ fabric rectangles) plus border fabrics. Follow along as we demonstrate how to create January’s block, Nancy’s Spool. Earlier this month, Team Nancy Zieman introduced the New! 2019 Summer Picnic Block of the Month Series. Join the New! Summer Picnic 2019 Block of the Month Series, anytime, by viewing the supply listing in the January 5th NZP Blog Posting. Keep your fabric choices sorted using this handy Fabric Planner diagram. Download the planner HERE. Make notes or pin swatches to remind you of the fabric placements. For the Afternoon Picnic—Summer Picnic, Nancy’s Spool block, select the following fabrics from your Nancy Zieman’s NEW! Afternoon Picnic Fat Quarter Pack from Riley Blake Designs and a Nancy Zieman’s No-Hassle Triangle Gauge by Clover. 1. Create a modified 16-patch block with two different sizes of finished 1/2-square triangle fabric combinations: 3-1/2″ and 6-1/2″. Mark each block set diagonally from corner to corner, using a fabric marking pen and ruler. For greatest accuracy, use a No-Hassle Triangle Gauge. The left side of the gauge is designed to create the 3-1/2″ HST blocks. Depress the button on the sliding portion of the gauge and move to the 3-1/2″ HST icon on the left side of the gauge for the 3-7/8″ squares. Depress the button on the sliding portion of the gauge and move to the 6-1/2″ HST icon on the left side of the gauge for the 6-7/8″ square. Place gauge on the block set, corner to corner. Match corner marks of gauge with corner of block sets. Mark fabric through center of gauge with a fine-point, fabric-marking pen. 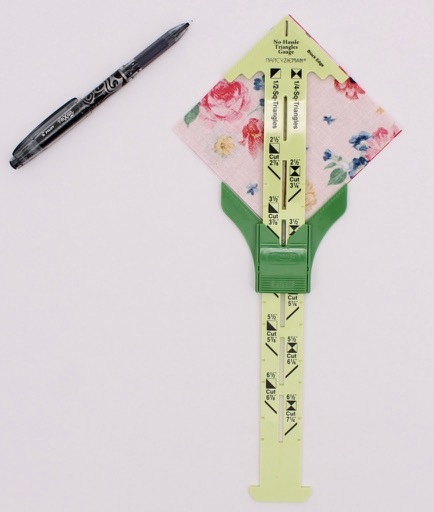 The advantage of using the No-Hassle Triangle Gauge is accuracy. It’s easy to double check that the block set fits within the confines of the gauge. If the block set extends beyond or is shorter, trim or cut another block. Attach a 1/4″ Patchwork/Quilting Foot to your machine. Set machine for a straight stitch, 2.0–2.5 mm in length. Align foot along one side of the center marked line; stitch a scant 1/4″ from center marked line. Do not cut the threads. Kiss the next block set to the stitched block and chain stitch from one block to the other. Clip threads between chain stitched blocks. Rotate blocks 180-degrees. Align foot along second side of center marked line; stitch. Clip threads between chain stitched blocks. With a rotary cutter, mat, and ruler, cut the blocks apart along centerline markings. Press seam allowances toward the darker fabric. Create a total of ten HST units. 2. Lay out Nancy’s Spool block as follows rotate squares as necessary. 3. Join squares to form a block. Place the 3-1/2″ squares from upper right and lower left column, right sides together. Stitch rows together to create two 6-1/2″ squares upper left and lower right. The No-Hassle Triangles Quilt Blocks book shows exactly how to create this block and 11 others. For best results, use the No-Hassle Triangle Gauge. Watch No-Hassle Triangles Quilt Blocks (Part One and Part Two) on Sewing With Nancy online. For a chance to be the random winner of a Nancy Zieman’s NEW! Afternoon Picnic Fat Quarter Pack, please leave a comment below. 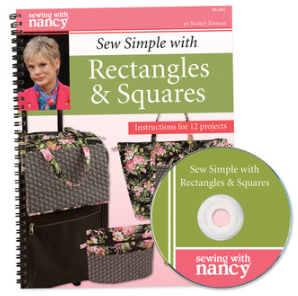 The randomly selected winner of a copy of the book Sew Simple with Rectangles & Squares from Nancy’s Notions, is Jacqueline Samford. Her comment is: You know, I could use plastic bins for organizing….but since when does plastic have personality? We are colorists! We choose the look and feel of fabric because it feeds our need to create something of real value. These fabric bin ideas are inspiring us to do what we love! Great ideas! Can’t wait to see this one finished!!! Pretty block to start the BOM! I love the colors and prints in the collection. Thank you for the sample block sheet…great for coloring fabric choices before cutting the fabric. The new BOM is featured the third Saturday of each month. Thanks for the post. Pretty fabrics, light and airy. Lovely collection for a summer quilt to take along on a picnic! The fabric collection is beautiful. The colors and patterns would make a lovely quilt for a young girl’s bed. I learned to quilt with a quilt along on line. This has such pretty fabrics and colors, especially the floral – so light and airy. Love them and can’t wait to start. I absolutely love these prints and the colors! I love 1930′s prints and these are reminiscent of those. Nancy would love them, too! I am thinking of taking part in this block of the month. I would love to win the fat quarter stack!! Using your great instructions, I started and finished the first block of this quilt. It went together very easily and looks like the picture. I’m looking forward to the block next month. The color and design of the fabrics express joy and coupled with the block design of Nancy’s Spool invite you to sit on a homemade quilt at a picnic! These fabrics remind me of a wonderful day at the park, having a picnic lunch and relaxing. What lovely fabric! I am looking forward to all the 2019 BOM tutorials. Thank you for sharing this great project. Love, love these fabrics and the pattern. This is a great tutorial to save! Very nice summer fabric for a quilt. These fabrics have me dreaming of summer and all the beautiful quilts which can be created from them. Nature, especially flowers, are an inspiration for many of my quilts. The fabric prints compliment each other very well with a springy look and combined together they look fantastic in Nancy’s spool block. I am anxious to start the new quilt this year. I have made all of the previous years quilts and treasure each one. Love the colors. They are so bright and cheery. Love the fabrics. When I click on the link for the PDF of the block all I’m getting is the block diagram. Is there not going to be a PDF of each block? The fabric reminds me of the type of fabric my grandmother sewed with.. I always like your careful directions. So glad the quilt blocks start with one designed by Nancy. Nice tribute. Thank you. Can’t wait to get started choosing fabrics and stitching. Love these fabrics. So sunny and bright. Oh these fabrics are wonderful. Makes me think of Spring and Summer. They are so bright and cheery. The quilt is perfect for draping over the bench on the front porch, grab a drink and a good book … delightful. These fabrics are lovely. Nancy’s Spool is a tribute block to the many enjoyable hours watching “Sewing with Nancy”. Love the fabric .. first block looks like fun to make. What is the amount of the different fabrics we would need for this beautiful quilt. I don’t think it’s the fat quarter bundle. I love the beautiful colors in the quilt. The gingham and flowers patterns together suggest carefree moments such as would be experienced at a picnic! Vivid colors hint at energy–let the games begin! Potato salad and fried chicken, anyone? Yes, please! Looking forward to making this quilt with all of you. I would love to make this beautiful block as it reminds me of Nancy and her love of sharing her skills with the world. Thanks so much for the chance to win. A beautiful quilt! I love the vintage quilt stack colors, too. These are beautiful summery fabrics! I’ve always liked the spool block. It would be great to have the same fabric to use. Looks like summer to cheer one now in the winter. A great quilt and great fabrics! Just what I needed to see on a winter day. What a fun collection! Perfect for a sampler quilt made of fun blocks. The fabric is bright and cheerful. What a breath of Spring! Beautiful fabric – I can see the summer flowers and colors coming already. Reds and blues have always been favorites of mine. The dots and florals are some of my favorite patterns. These fabrics are winners as far as I’m concerned and starting with Nancy’s spool is a great tribute to her. I agree with Ann and Sharon the colors of the fabric are just fantastic-so bright and cheery. Love the spool block too-a great BOM for sure -thank you so much!! The colors and flowers bring a much needed feel of spring in the midst of the barren winter landscape. The fabrics sing to me – calling me to the outdoors with all the beautiful color of the flowers and the trees and the sky. What a great BOM for 2019! Love the colours used for this quilt and the fabrics are very reminiscent of a simpler time. Very pretty combination.